Speed your magnification adjustments with an optic upgrade to the Anarchy Outdoors US Optics Throw Lever. 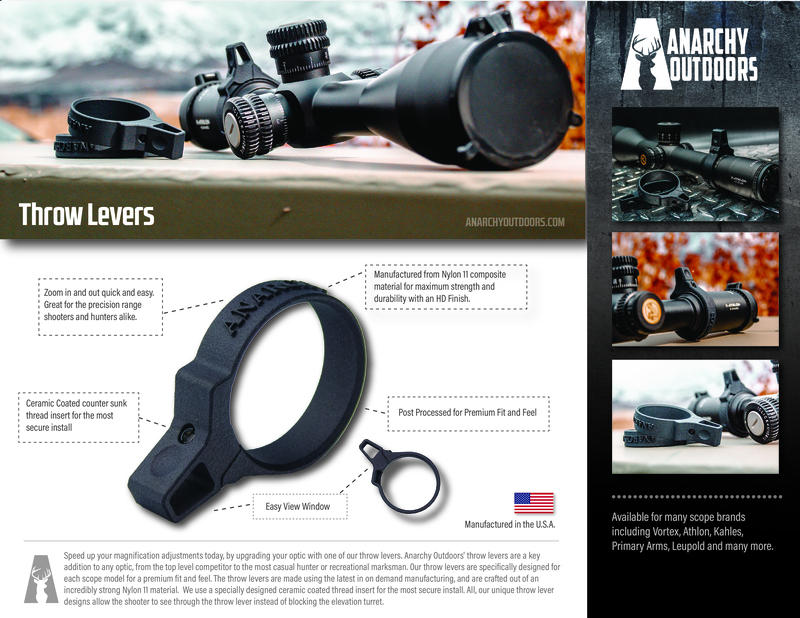 Anarchy Outdoors' throw levers are a key addition to any optic from top level competitor to the casual marksman. AO throw levers are specifically designed to each model for a premium fit and feel. Our unique throw lever designs allows you to see through the throw lever instead of blocking the elevation turret. Engineered using the latest in on-demand manufacturing, our throw levers are crafted out of an incredibly strong Nylon 11 material and use a specially designed ceramic coated thread insert for the most secure install. Installation is lightening fast- simply loosen the screw, slip the throw lever over optics' magnification adjustment ring and tighten down the inline screw. Each throw lever is post processed for an HD finish and double checked for outstanding quality.